(Above) Nate & Finn praying with the team backstage before a worship service at Northview CC. We often tell people how blessed we are to have such generous and faithful backers. We can't express to you enough how vital this is to a lasting overseas ministry. Last month we highlighted a few of our amazing supporting churches that we visited in the month of May. We created fond memories with more of our churches in June. Northview Christian Church in Indianapolis, IN is so special to us. After we graduated from university in 2002, Nate was hired as their worship minister and Whitney was later hired as Communications Director. Our experience at Northview gave us vital ministry experience for planting churches in New Zealand. This church sent us out to New Zealand in 2007 and they have been backing us ever since. It was so nice to spend a week in Indy catching up with old friends and leading worship at Northview. On June 14th our paths crossed at NCC with Jonathan and Sarah McCallum (missionaries in Spain), so lead pastor, Nathan Rector, interviewed both couples and inspired the congregation with stories and insights from what God is doing through Northview overseas. We had such a great stay. Our next stop was Worthington Christian Church in Columbus, OH where all of Whitney's siblings attend. Worthington feels like a second home church to both of us due to the family connection and many other relationships that go back to our time at Kentucky Christian University and beyond. Worthington has been supporting us faithfully since 2007. Each time we visit Worthington, we feel a closer connection. As Nate led worship there on Father's Day this year, it was so nice to look out in the audience and see all of the Meaige family worshiping with us. We look forward to continuing and deepening our relationship with all of you at Worthington Christian Church. You're making a huge impact in Columbus and New Zealand! We have several more events on the calendar before we return to Auckland on August 18th. In addition to a couple of return visits, we'll be leading worship at Stanton Christian Church in Kentucky, at Summer in the Son at KCU, and MeadowView Church of Christ (see events for details). We are so grateful for the love, encouragement and financial support from all of these organizations, not to mention so many individuals within them. We can't express how important each of you are to us. We will always cherish you, pray for you, and look forward to our visits in the future. June was a big month for our family. Lane turned seven years old on the 16th and Henry turned five on the 25th. It was so nice to share their birthdays with cousins, aunts, uncles, and grandparents this year. We are so lucky to be parents to all three of our kids. Travelling over several months takes it's toll on a young family as you might expect, but we are managing and enjoying moments like these with extended family along the way. Our first full month of worship leading and church-updating is complete. It was a busy and encouraging time for our family. Our relationships with each church grew stronger and we were reminded once again that we have truly outstanding missions partners. We spent two weeks in Indianapolis at Greenwood Christian Church. We were thrilled to get the news that GCC would continue to support us after narrowing their missions focus over the past couple of years. Our continued partnership with them is significant as we look toward the future and our next church plant in Auckland. The church was very encouraging and many there have become close friends of ours. Thanks for a wonderful weekend, Greenwood! Our second stop was Paris, Kentucky at Bedford Acres Christian Church. This church is special to us because it's where Nate began his worship leading journey in 1998 and it's where Nate's father, Jim Hutchison, was the Senior Minister for many years. It's always a joy to spend time with these special people. With bluegrass music being a part of the history and culture of that area, we thought it would be fun to treat BACC to a good ol' hoedown worship time. The Graham Family, who travel all over the state pickin' and grinnin', joined Nate and the band that morning. It was so much fun. Thanks for a great memory, guys! Our final stop in May was Zanesville, OH at North Terrace Church of Christ. 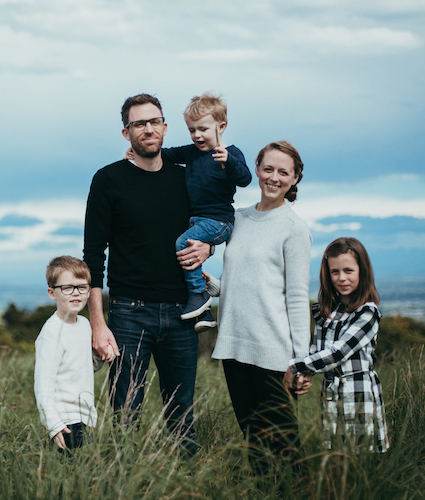 NT has been a huge blessing to us from the beginning of our time in New Zealand when they made us their living link missionaries, meaning they provide a significant portion of our financial needs and connect with us on a personal level as much as possible. They take such good care of us. Bill Meaige, Whitney's father, was the Senior Minister at NT for more than 30 years and remains on staff as the Senior Adults Minister. We spent Sunday evening updating the congregation on our work and future plans in New Zealand. This church is always so encouraging and thoughtful. NT, we are blessed to be your living link missionaries. We really couldn't do this without you!